So, somehow I failed to notice I hadn't actually written a Kerrigan post before. To rectify it, here's how I crafted the rest of her! She's about 50% painted so far, and once I'm done focusing on my Prussian fleet I'll finish her. First, as always, I collected bitz that might be appropriate for the build. She's actually quite a long running idea in my head, and I've had pieces of her in some form or other for over a year now. I was always halted by trying to figure out how I'd do the back blades without them being an eternal nuisance, and on the head. The latter I solved by hacking the head off a Mordheim model that will likely never see the table, and when she does, it'd be in a setting where her having a creepy mask would be more appropriate than a bare head. Second I did my image collection. When starting any project, I highly recommend scouring the internet for any photographs or illustrations you can find, to give you ideas, and in the case of historical models, to ensure what you want to do 'actually happened'. In this case, I managed to find a blog detailing the construction of the 1:1 model of Kerrigan made for Blizzcon a while back, which was fantastically useful, as it gave me detail I would never imagine being able to put on 28mm, but could now pick and choose. I'd link it here, but I don't recall specifically which blog, and it's pretty easy to google and find. Next came most of the body: It was essentially an older-version Dark Eldar warrior, shaved down in all kinds of way (most extensively around the shoulders) to look more natural. 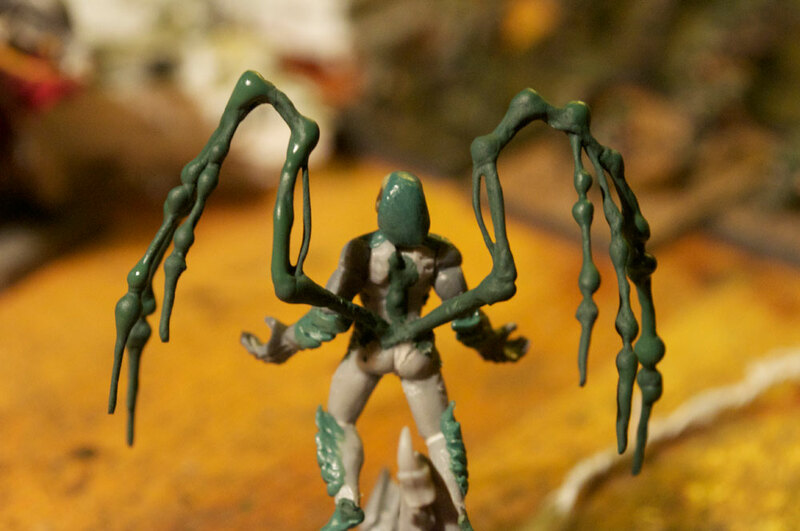 The feet are putty, because Kerrigan has distinct 'high-heeled bare feet' that I wanted to emulate. The hips were heavily modified to match the leg crests she has, which also included her sculpted abdominal armour. The torso you can see in the picture above was heavily modified to make them narrower, which makes her shoulders look less man-ish, and gives her as much of the 'graceful curves' (and sharp edges) that make her model design so fascinating. The arms are heavily modified Eldar biker arms, repositioned at the wrists, cut in at the shoulders, removed of all detail and most of the armour plating, and with extensive (and incredibly careful) finger thinning and separating. Her hands are still overlarge, but I am okay with this both because any more and they'd be too delicate for a play model, and her model design does often have large-ish talon hands. In the picture above you can see what I eventually decided on for doing her back blades. I figured a couple strands of thin-gauge modelling wire, with liquid greenstuff (LGS) covering it should give me the look I desire, but with an ability to bend that would let me pose them, and resist full-on breaking. Here you can see where they connected to her hips, just like in the full-size model. 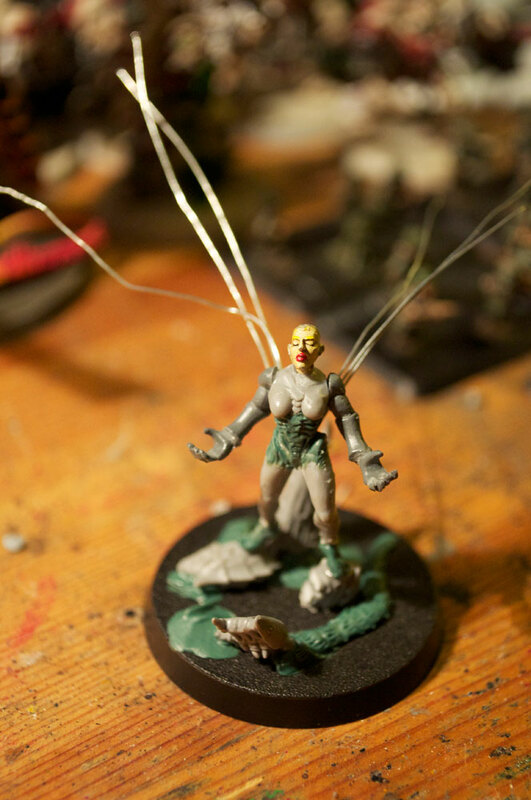 I also started to use her base as a dumping ground for putty left over from other projects (like the Panther build) to make up something that would look like "Creep". The wires were next twisted and bent to form the various joints and bony protrusions, and I intentionally made the wires too long so that I would end up with some I could clip to length after I figured their final shape. Finally, with the LGS applied (and still drying) on this one you can also see the bony crests on her legs, a bit on her arms, and the start of her epic hair. The liquid greenstuff was built up over layers, first to thicken out the primary joints, and then by segment I forced a bead of LGS to dry and harden at each segment, to give the appearance of knuckles. After this each segment was thickened up gradually with more LGS until I got what felt like an appropriate thickness. The nice thing about LGS for this kind of work is that it dries roughly cylindrical on the wire, with perhaps a little bit of a need of sanding, and is pliable enough even when dry that you can fine-tweak the blade shape. It's also fantastic for projects like this where standard greenstuff would be too thick, or require far too much time to finish off properly.